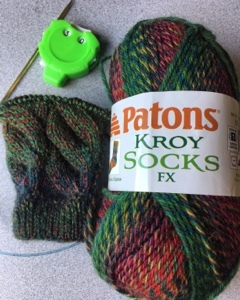 This past year I've read about fun swaps and knit a longs, but I have not been participating. My updates to the blog are much father spaced than they used to be. 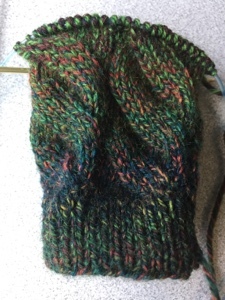 My knitting has not been consistent. I just haven't had the heart to set myself up for failure. Dee from Pointy Little Sticks though began to draw me in with talk of a Fall Knit Along. Ariagnee began to stock up on her beautiful fall supplies of all kinds of crafts and well. I was beckoned. The timeline seemed manageable for a pair of socks, even for me! So here we are. A pair of Nutkins in progress. I've got 30 rounds of pattern on the leg after 10 rounds of K1P1 rib because I really can't be bothered with the newfangled cuff method in the pattern. I may or may not do the short row heel and 3 needle bind off. I have time to figure out how "experimental" for my own skill set I feel like being. The yarn is a solid work horse Kroy. However I have struggled knitting this yarn at night. As pretty as it looks in the light, it's gone through some dropped stitch recovery and backing out already. This colorway requires good lighting and reading glasses. Have you cast on? Are you feeling good about fall?